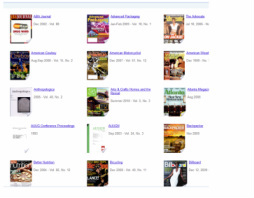 Through the library, you get free and instant access to the most popular magazines. Checkout and read the latest issues of your favourite magazines however you like - in the browser, on your phone, or on a tablet. Flipster is easy to use and super convenient. Password: same as the EBSCO databases - ask the librarian if you don't remember! Howe Sound Secondary learning commons subscribes to many print magazines. Enjoy reading the most current issue in the library, or sign out one of the back issues for a 3 week loan period. 1. To browse through the titles available, click on the icon or title link (found above). This will take you to the database. This will take you to the EBSCO record for the magazine. 2. Click on the year you want to browse (found on the right side of page). 3. To search within the whole collection of a particular magazine, just click on "Search Within This Publication."